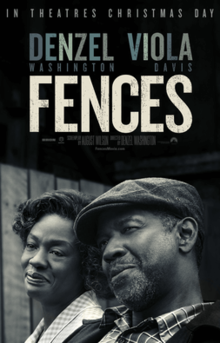 Fences was a movie with Denzel Washington's fingerprints all over it. He directed and starred in the film and was joined by a talented cast including Viola Davis, Russell Hornsby, Jovan Adepo, Stephen Henderson, and Mykelti Williamson. The film takes place in the 1950's where Washington's character, Troy, is a 53-year-old man who never realized his dream of becoming a professional baseball player because, he says, of the color of his skin. Instead, he is a garbage man who makes just enough to support his family. He has become callous and developed a cynical view of the world. His teenage son wants to play football, but Troy thinks going to work and school are more important. The two clash, and create the tension for the film. Troy is a hard-working man, who is very set in his ways and resistant to change. We follow his journey as he tries to cope with changing circumstances in his life and difficult relationships. Troy is a very complex and multi-layered character, and I feel Washington displayed his best acting abilities in this film. If you are a fan of Denzel Washington, you can't miss this. The film tackles some heavy topics including race, death, manhood, and inequality. It is heavy on dialogue and was slow-moving at times, but it was a nice breath of fresh air from the superhero, sequel, and reboot films that dominate the Hollywood landscape today. If you want a movie that will move your emotions, this is definitely one to see. The only caveat is that it is almost 2 1/2 hours, so be prepared to devote some time to it. You won't regret it.